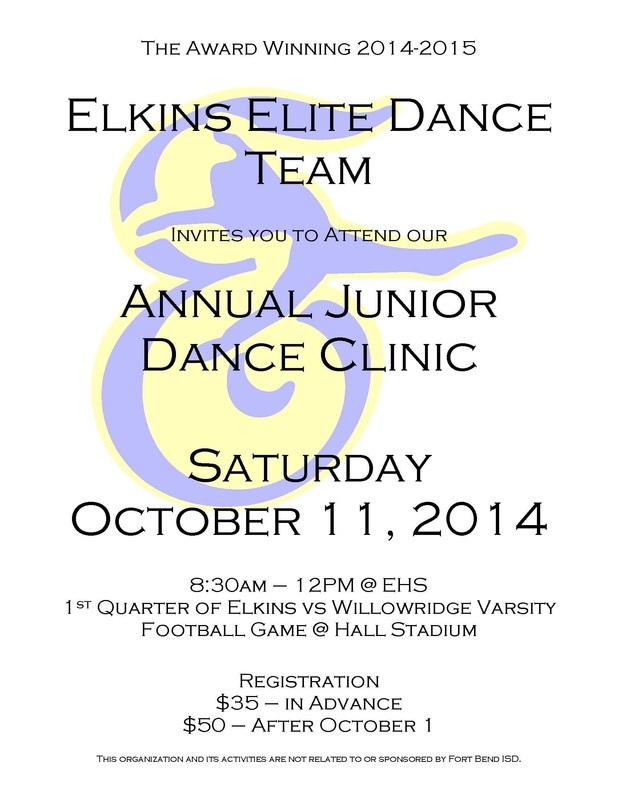 Register by Wed., Oct. 8th for the discounted rate of $35 for The Elkins Elite Dance Team annual Junior Dance Clinic on October 11, 2014! We are extending the deadline for the discounted price of $35 for all registered by Wednesday, October 8. 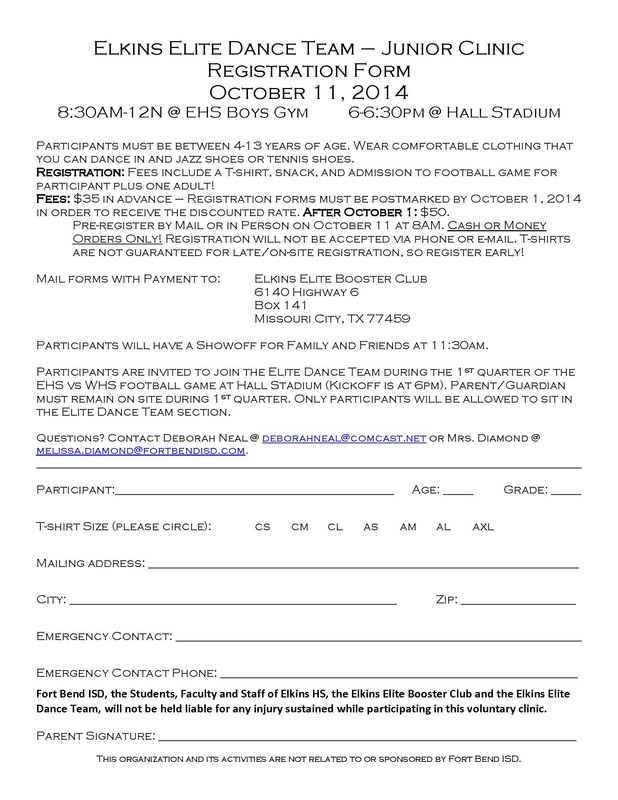 The Elkins Elite Dance Team is hosting its annual Junior Dance Clinic on October 11, 2014 at Elkins High School and we need your support! The clinic allows the members of Elite to connect with the community while raising funds for the team. These very talented young ladies are able to get involved with the community on a much deeper level than returning a smile or wave during a performance. Participants ages 4-13 are able to learn about dance in a fun, positive atmosphere while getting a sneak peek into the life of a high school dance team member. Elite is able to share their experience, and hopefully instill the desire to continue to dance and someday join the team as a member of the Elkins HS student body. Several of our current team members have attended as participants. This year participants (and a parent) are also invited to join the dance team that same evening at the Elkins varsity football game at Hall stadium. Participants will perform stand routines with the team during the first quarter. This game we will be focused on breast cancer awareness, so our shirts are pink to help bring attention to the cause. The members of the Elite Dance Team are very dedicated and hardworking young ladies. They practice year round to prepare for performances at varsity football games, pep rallies, community events, dance competitions, and the team’s annual spring show. All of these activities require a lot of supplies and equipment that FBISD is not always able to cover financially. The fees for practice wear, summer camp, costumes, entry fees, consultants, etc. can add up quickly and all these items are necessary for the flawless performances Elite is known for. Now accept credit cards or money order made out to Elite Booster Club! Attn prospective '14-'15 Elite Dance Team Candidates: It's not too late -- bring completed app to today's clinic in the girls gym @2:40! If you would like to try out,but were unable to go to yesterday's clinic session, it's not too late! Please bring your completed application to today's clinic in the girl's gum. We begin @ 2:40 p.m. See you there! Tryouts for the 2014-2015 Elite Dance Team will take place next week on Thursday May 1st at 3:30pm. Mandatory clinics are April 28th, 29th, and 30th in the girls gym from 2:40-4:30pm. Applications are available in the dance room or online at elkinsdance.weebly.com. See Mrs. Diamond or any current Elite if you have any questions. Good luck to all candidates! The Elkins Dance Department is proud to present this year’s spring show, “Elite Extravagaza!” this Fri. and Sat., April 25th & 26th at 7 p.m.
Come see the Elite Dance Team with special guest performances from the Elkins Dance classes and the JV Dance Team, as we “Explore the Elements”. Performances will take place this Friday and Saturday night at 7:00pm in the Elkins Auditorium. General Admission tickets are $8.00 in advance and $10.00 at the door. Reserve seating is available for $10.00 in advance and $12.00 at the door. Please see Mrs. Diamond in the Dance Room or any Elite for more information. Congrats Elite for excellent performances at the ADTS Alamo Dance Classic! Mrs. Diamond is proud to announce the success of the Elite Dance Team this past weekend at the ADTS Alamo Dance Classic in San Antonio. Brianna Humphrey and Kaytlyn Collier earned a Division 1 rating for their duet. Erika Freeman earned a Division 1 rating for her solo. Victoria Hackney was 3rd Runner Up, Lauryn Green was 1st Runner Up and Sydney Cutler placed 1st in the solo category. The Dance Officers earned a Sweepstakes Award, the Gussie Nell Davis Award of Excellence, Judges Awards in Jazz, Contemporary and Pom, Best Overall Technique, Presentation and Choreography and were named Best in Class Officers. The Team earned a Sweepstakes Award, the Gussie Nell Davis Award of Excellence, Judges Awards in Jazz, Pom, Military and Modern, and Best Overall Presentation, Precision and Choreography. The Team also earned Academic Champions and was named 1st Runner Up Team. Congratulations Elite on a very successful contest season!! Mrs. Diamond would like to congratulate the members of the Elite Dance Team who competed yesterday at the Fort Bend Dance Classic. In the junior solo category Kaytlyn Collier, Genay Fields, Erika Freeman, Kaitlin Harrison, Brianna Humphrey and Lexi Mitchell received Division 1 ratings. In the senior solo category Sydney Cutler, Lauryn Green, Victoria Hackney, Valerie Ndubuike and Michelle Pacheco all earned Division 1 ratings, and Sydney Cutler was named one of the top senior solos of the day! In the duet category, Division 1 ratings were given to Kaytlyn Collier and Brianna Humphrey, as well as Victoria Hackney and Megan Washburn. Congratulations to the dance officers for earning division 1 ratings for their jazz, contemporary and pom routines. Great job ladies! You did an excellent job and represented Elkins very well! Eat at Carl's Jr. on Wednesday, Sept. 25th 6:30 to 8:30 & support Elite! ELITE SPIRIT NIGHT: Come out to Carl’s Junior on Highway 6 at FM 1092 on Wednesday, September 25th for Elite Spirit Night from 6:30 to 8:30pm. You’ll get to see a special performance by our very own Elite Dance Team, and 20% of all proceeds will be donated to Elite. Hope to see you there! Elkins Dance Department is proud to present this year’s spring show “Elite Extravaganza”! Come see the award winning Elite Dance Team, with special guest performances from the Elkins’ Dance classes and the Freshman Dance Team, as we “Travel the World”. Performances will take place this Friday night, April 26th and Saturday night, April 27th at 7pm in the EHS Auditorium. Tickets are $8 in advance and $10 at the door. Tickets will be on sale at ALL lunches this week. Please see Mrs. Diamond, or any Elite member for details. Mandatory clinics are April 29th through May 1st in the girls gym from 2:45-4:30pm. Tryouts are on Thursday, May 2nd at 3pm. Applications are available in the dance room or online. See Mrs. Diamond or any current Elite if you have any questions. Good luck to all candidates!